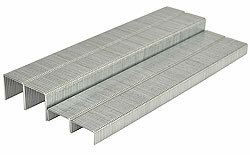 Fasco EB8006 - EB8014 staples. Fasco brand, Made in Europe. Interchangeable with BEA 80/380, Atro 8, JK680, Spotnails 80, Haubold 800, Empire 8, Rainco 8, Prebena A. For applications: upholstery, bedding, dust covers, windows, doors. etc.